While some business pundits are forecasting 2017 as the year of the customer experience, I think their prediction actually falls short of naming the real difference maker. Don’t get me wrong. I agree that a positive customer experience is essential, but what the pundits are overlooking is the key factor in creating that positive customer experience: employee empowerment. That’s why I think a culture of empowerment is what will truly define innovative, leading organizations in the year to come. 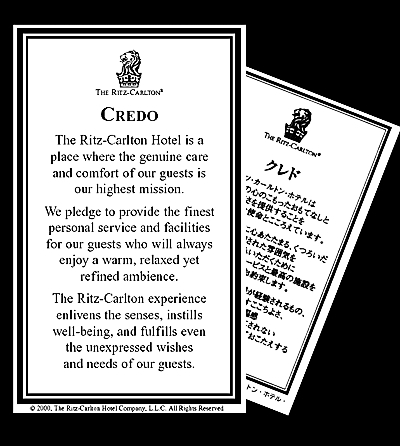 For another example, consider the hospitality industry, where every Ritz-Carlton employee is empowered to use his or her discretion to fix or improve a guest’s experience. In fact, the hotel chain puts a value on this discretion: Employees can spend up to $2,000 of hotel funds to please a guest. And what does it take to create this kind of environment? Organizational leadership that has a real concern for individuals and that demonstrates that concern by teaching, mentoring, challenging, coaching and cheering people as they develop new skills. Most of this vision statement is easy to understand: We will be partners with our clients; we will simultaneously create success in both our business and theirs; and we will be recognized as a national leader in our three market segments of Healing (healthcare), Learning (higher education), and Discovery (science and research). But what about that last part, that statement on our culture that includes the word “empowerment?” Why would we include that? Because empowerment is integral to making the first part of the vision real. Of course, if you talk to organizations such as ours, the Ritz-Carlton and Nordstrom, you might hear countless reasons for empowering employees. But I see seven basic reasons for including empowerment in our vision of the future. Reason No. 1: A culture of empowerment improves the service we provide to our clients. As a young engineer-in-training, I remember being on a construction site reviewing a project that had been designed by another, more experienced engineer. One day, the contractor found me and asked a question. We had designed “x” and he wanted to do “y,” which was cheaper and faster and would have no impact on quality. “Could we do it?” he asked. I knew the answer I would give if I had the authority, but I didn’t. I couldn’t call the engineer and have him answer the contractor at that moment because the engineer was on vacation. So the question went unanswered for almost a full week. If you know construction, you know that time is money and answers need to come immediately. But I was not empowered to make that decision. Reason No. 2: Empowerment improves the quality of your work. People who feel responsible for their work put in the extra effort to make sure it is top-notch. They won’t let a deadline come and go without making sure they have delivered the quality they expect from themselves. This sense of responsibility eliminates any “That’s not my job” or “She told me to send it out, so I sent it out” mentality, and it spurs people to “sound the alarm” if they see trouble looming. You see this last point in the Total Quality Management approach that drives the auto industry to give all employees, no matter their position in a company, the authority to stop the line if they see something that threatens quality standards. Reason No. 3: Empowered employees are happier. When people think of the achievements that make them most proud, they usually remember times when they had to overcome major obstacles. Our memorable achievements happen when someone mentors us, gives us the training we need and then lays down a challenge and cheers us on as we meet it. Once we’ve accomplished something we’ve been empowered to do, we feel accomplishment and self-worth, and our confidence grows, and that leads to greater engagement. The result? Organizations that provide this type of empowerment experience lower turnover, and the culture serves as a positive environment for employees and leadership. Employees want this, even if they might not think to call it empowerment. I saw this in a conversation I recently had with a young architect in our firm. She said, “I want to be given a task or an objective and then given the responsibility to go out and figure it out. I know I’m young and don’t know everything, but I want to collaborate to create solutions. I don’t want to be told specifically what to do and how to do it. That’s not collaborative, and it doesn’t give me a feeling of responsibility.” She didn’t say the word “empowerment,” but that is exactly what she was talking about. If companies want to attract and retain talented professionals like her, they need to create cultures of empowerment. Reason No. 4: Empowerment boosts innovation. When someone is given a goal and some guiderails, but not told in detail how to accomplish the task, new ideas happen. People try things they have never tried before. And the result can be a better result, faster timeline, or both. In an industry sometimes hamstrung by the tried-and-true three-phase design process of schematic design, design development and construction documents, we recently were challenged with meeting a client’s needs in a timelier fashion and with a smaller team than normal. The team, empowered to do whatever it took, replaced the three-phase approach with a streamlined process that pulled the necessary information out of the client more efficiently. The result was a great design completed in a quarter of the anticipated time. Reason No. 5: Empowerment speeds things up. In today’s market, things change quickly as companies react to market forces, current trends and changing customer needs. We faced this recently when, in the middle a project, we were told the client’s strategy had changed mid-stream. Overnight, we went from designing a medical office building to designing an entire new hospital for the same site. We needed to respond nimbly, without the restrictions of command-and-control management and without forcing our trusted designer to sit around waiting for a principal to make decisions. Instead, we gave the designer the authority to adapt to the changing project environment, and he came through with a solution that was good for the client and the speed of the project. Reason No. 6: Empowerment results in collaboration. As people approach the edge of their comfort zones, they like to bring others onboard to help ensure they don’t make a mistake. They seek input from others to confirm their ideas, or to offer improved solutions. As a result, you get results from a group of collaborators that are superior to the solutions produced by one high-functioning brain, and you also build relationships and trust within the organization. Reason No. 7: Empowerment results in strategic thinking. A leader who spends all of his time “doing” isn’t spending any time creating strategy, and leaders who use a command-and-control management style spend much of their time managing details: identifying what needs to be done and how it should be done, instructing employees on what to do and how to do it, and then checking to make sure it was done in the identified way. On the other hand, leaders who provide guidelines and make sure employees understand the goals and are trained to do the work, and then let them do it will find themselves with time to spend on big-picture thinking. Now, if you are convinced by those reasons that creating an empowerment culture is worthwhile, you probably are wondering how you go about it. For guidance, I turn to the book “Employee Empowerment, the Rhetoric & the Reality” by Dr. Rozana Huq. It offers a multi-dimensional approach with four key elements. Power Sharing is the act of passing previously held power and authority to employees further down the hierarchy. While some leaders are reluctant to share power because of fear (“What will I do if my employees are doing what I’m doing now?” or “How can I ensure it’s done right if it is out of my control?”), failing to do so might result in employees who lack self-esteem because their perceived power has been taken away or they realize they never had it in the first place. Leaders need to take the leap and appreciate that they are giving away power in order to spend their time on strategic activities that feed the growth of the organization. They must also communicate clearly with employees about the limits of their power and the resources they have available for support. Participative Decision-Making stems from the economic argument that employees who are given the authority to make decisions will contribute more to the effectiveness of the organization, and decisions should be made as close to the problem as possible (think local versus federal government). The challenge here is that some employees can become concerned about the consequences of failure – they may feel they are in danger of losing their jobs or being otherwise penalized or marginalized as the result of a wrong decision. Leaders must create a culture of safety and risk-taking that allows mistakes to be made comfortably. Devolution of Responsibility means employees are authorized to be responsible for their own work. In this environment, the employee becomes both the “doer” and the inspector. Unnecessary, non-value-added processes are eliminated, and employees are involved in the overall improvement of the organization. This is where the rubber meets the road because the employee feels like he or she is making an impact, has meaningful work, and is entrusted. The danger is that some employees might feel they are being given more work for no reward, and the resulting stress will become an unwelcome development. Leaders must recognize these traits in employees and respond accordingly. A People-Oriented Leadership style makes this all work. 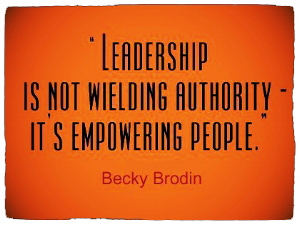 An empowering leader is interactive, provides challenges, builds trust, encourages collaboration, gives praise liberally and shares power and information willingly. The leader constantly communicates with the employee to make sure he or she understands the guidelines, is invigorated by the work, and feels empowered to make decisions and responsible for his or her own work as well as that of the team. The leader guides the team to establish the objectives, clarifies the limits of authority and enables individuals to take responsibility for achievement of the objectives. The emphasis here is on the word “enable.” The leader must provide the training and resources needed for the employee to be successful. The good news is, this process is as rewarding for leaders as it is for employees. Personally, I receive great joy from empowering people and watching them grow, uninhibited by having someone tell them what to do and how to do it. For example, we have two young engineering designers in our firm who have been given more and more responsibility and autonomy as they develop their skills. Three years ago, they were considered drafting technicians – basically, employees who stay in a cubicle and are told what to draw, when the drawing is due, and sometimes even how to draw it. Today, because they have been empowered in their positions, they meet with clients, determine the design direction and ensure it is implemented accurately. They are empowered to work with contractors and make decisions in the field during construction. They are responsible for directing others as they lead projects. Through this empowerment, they grow professionally while delivering expert service to the client. It brings a smile to my face to see them grow and succeed, and to watch them empower others. As I see it, empowerment requires people to be responsible. In an empowerment culture, individuals take responsibility for their work environment and processes to ensure they function efficiently. Empowerment also requires communication that is open, honest, transparent and vulnerable. It requires trust so people feel safe to take risks without fear of reprimand or humiliation. Empowerment requires a dedication to learning and growing within the organization, and it results in a culture in which individuals are encouraged to change negative behaviors, challenge themselves and support each other in a learning environment. These are the elements of an empowerment culture, and, therefore, the components of a culture of innovation, collaboration and success. It is not a culture that can be created overnight, nor is it one that will come about easily. However, it is the kind of culture that will allow for the enhanced customer experience some say will be the hallmark of the coming decade – and that, without a doubt, will be an integral part of any thriving organization.